The German tank destroyer Jagdpanther used proven Panther medium tank chassis' fitted with a fixed fighting compartment and a powerful 88mm gun. A late production variant of the Jagdpanther now comes as a 1/35 scale plastic assembly kit model. 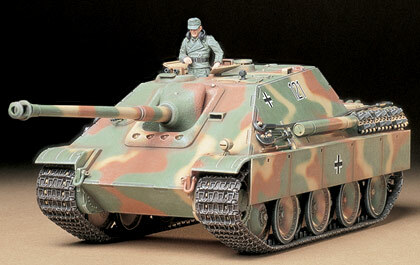 You can choose to assemble a Jagdpanther produced from May to December 1944 or from December 1944 onwards. The fighting compartment interior features superb details including the main gun loading part, bulkhead, and commander's seat. Movable escape hatch as well as open/closed selectable hatches provides the model with a greater presence. Kit includes parts to depict die-cast type exhausts as well as exhausts with flame dampers. One commander figure also included.